Finally! Over time, after a few tries and not being satisfied at all with the results, I very much loved the last modified attempt at this wonderful dish and I would like to present the recipe for the same. I had found this recipe several years ago from somewhere on the Internet. Unfortunately I don’t have the original link with me to give the person credit. I followed it to the dot many times, but it ended up not quite right. Hence I never posted it. My friends came over for dinner last Thursday, and I decided to give this another shot as it is very simple to prepare and goes great with some cucumber and yogurt raita. Although it was on the spicy side, everyone loved it. My wife is finally happy with something that I made :-). I have done some modifications over time to this dish. Here is the recipe. Although the ingredient list below looks very long, trust me, it is very easy to make. Just follow me through here. Heat up the milk in the microwave or a gas stove. Add the saffron strands to the hot milk and keep it aside to let all the flavor and color from the saffron get mixed to the milk. 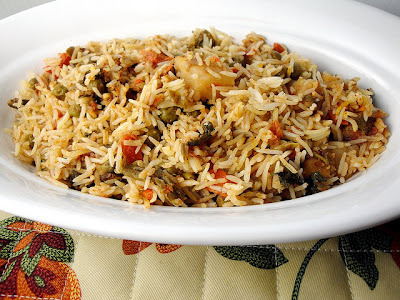 This is one of the main ingredients of biryani that gives a fantastic overall flavor and taste. In a large soup pot or similar vessel add 7 cups of water, 2 1/2 tsp salt, 7 kernels of black pepper, 7 cloves, 5 pods of cardamom, 3 bay leaves, 1 1/2 inch of cinnamon bark and 4 cups of rinsed basmati rice, and boil for 8-10 minutes. After this, just drain away the water and keep the rice and whole spices aside in the same container. In a large wok or similar pan, on medium heat, add 1/2 cup oil. When the oil heats up, add the onions. Stir cook the onions until they turn golden brown. Remove half the onions from the wok and set aside in a container. To the remaining onions in the wok, add the cumin seeds, coriander powder, green chilies, 3 bay leaves, 8 black pepper kernels, 8 cloves, 5 pods of cardamom and 1 1/2 inches of cinnamon bark. Stir everything together well for a few minutes. When the onions are well incorporated with the spices, add the potatoes, carrots, beans, peas, salt to taste and 3 tbsp cayenne pepper. Mix everything well and cook them for a few minutes on medium to high heat. In the meanwhile, blend the yogurt, garlic, ginger and the onions that were set aside until it is smooth. Add this to the vegetables in the wok along with the diced tomatoes. Cook on medium to high heat until the yogurt is completely cooked and you only see the cooked vegetables and the separated oil. Turn off the heat on the gas stove. In a 13 1/2" x 9 5/8" x 2 3/4" baking foil tray, add one layer of vegetables in the bottom, sprinkle half the finely chopped coriander leaves, and then add one layer of the rice. Repeat with another layer of vegetables, and then rice on top of that. So you have 4 layers in all. Sprinkle the remaining coriander leaves on top of the rice. Pour 1/2 cup oil evenly over the top layer of rice. Do the same with the saffron and milk mixture, spooning it evenly over the top layer of rice. Cover the tray with aluminum foil. Heat the oven on 350 degrees Fahrenheit. Put the foil tray in the center of the oven and bake for around 40 - 45 minutes. The rice would be done with a texture that is perfect for biryani in this time. Before serving, plate the biryani individually, mix the rice and vegetables well on the plate to incorporate all the different flavors. Sprinkle some roasted nuts on top (optional) and serve hot with yogurt raita, or salad on the side.